The erratic temperatures has the plants a bit confused. The mizuna and arugula bolted (flowered), so they are done for this season. The broccoli continues to produce a small amount of florets each week, but these will need to be pulled soon. The snow peas continue to supply a steady amount every other day, but the large leaf growth from the winter has died and new small leaf growth is now what is flowering. The last of the fall planted savoy cabbage was harvested, but the new spring plants are doing great and should be ready for harvest in April. The first turnip was harvested and the rest should be ready in April. The carrots planted in March are doing great. As the winter plants are harvested, I have been re-composting those areas for the next planting. The tomatoes are loaded with fruit. I just hope the weather cooperates allowing the fruit to mature before it gets too hot. The pumpkin vines really took off in March and there are about a dozen little pumpkins spotted. The swiss chard planted in February is mature and giving a steady supply. I harvested the last of the red romaine from the fall planting and planted some leaf lettuce in March that is doing well in an area with afternoon shade. The second planting of cilantro is coming along well. The theme this spring was planting earlier than usual and second plantings of some herbs and vegetables do to the hotter temperatures that caused plants to bolt early. Unfortunately most of the honey bees that were in the garden the last couple months, were part of a hive that was under the eve of the neighbors house and they had to have it removed. So, there are still bees in the garden, but greatly reduced in numbers. I planted cilantro, basil, cabbage, dill, fennel, leaf lettuce, turnips, zucchini, watermelon and carrots in March. 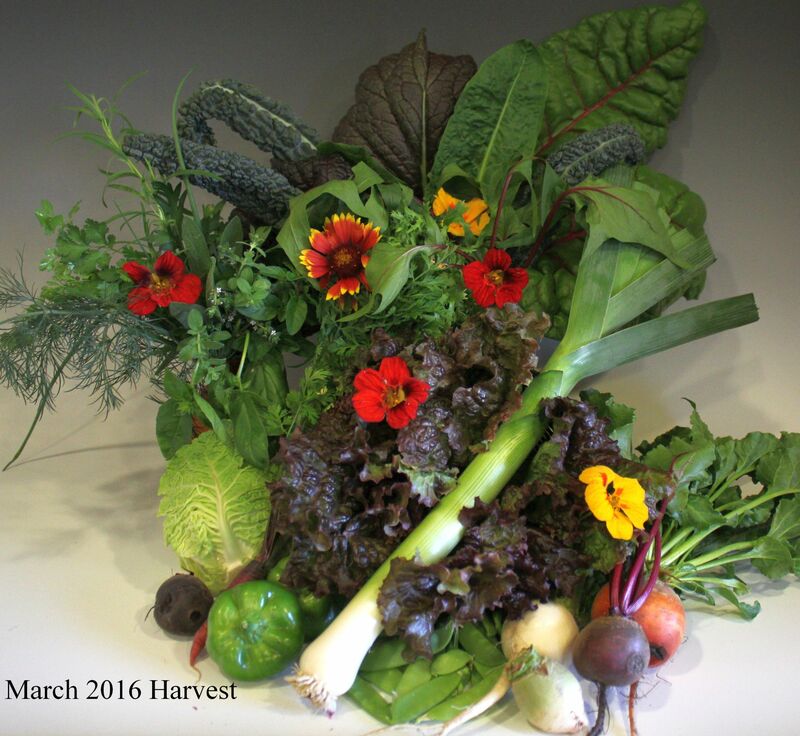 March Harvest picture - Swiss chard, Kale, mustard greens, endive, spinach, cabbage, red leaf lettuce, leek, carrot, beets, turnip, radish, bell pepper, snow peas, cilantro, chives, parsley, tarragon, thyme, basil, dill sage, marjoram, oregano. Planting guide updates include - I added cell shading to vegetables and herbs that are good to grow in the shade! I have added a best advice section to the update to pass down what I have learned and methods that may help you with your garden. See below! The snow peas continued to produce a steady supply. The pomegranate is flowering and the first fruit has started. The pumpkin vines have pumpkins. The oregano is coming back with lots of new growth in March. The tomato plants and grapefruit tree are loaded with fruit. The chili pepper plants have little peppers and doing great in the heat. Several plants bolted early with the warm temperatures. The birds/critters dug up some of my seeds, requiring re-seeding and making sure areas have protective covering. Keep your tomatoes and peppers moist, not wet. If you have them planted in pots they will dry out faster with warmer temperatures, so you may need to increase your water schedule. You may need to provide shade to the leafy greens and increase watering frequency with the higher than normal temperatures. Look for wilted leaves as an indicator that water is needed. With warm weather, expect to see more aphids on vegetables, shrubs, fruit and shade trees. Spritz them with water with a few drops of dish soap (blue, not yellow) added from a spray bottle which can be very effective especially it they are on your vegetable crops. You may need to cover some plants with white shade cloth to keep out bugs and prevent sunburn. 1. As the weather warms, adjust your irrigation timer to water more frequently. Be sure to run your system long enough to wet the top two feet of soil for trees and 6 inches for vegetables. Deep, infrequent watering is much better than a daily sprinkle. 2. The second half of April is the time to pull up your geraniums, petunias, snap dragons and plant summer flowers so the roots can establish before the tough heat arrives. 3. Place shade cloth over tomatoes to keep bugs away. 4. If you haven't pruned your herb garden, now is the time to do it. For frost damaged herbs, look for new growth emerging on the lower half of the plant. Use sharp shears to cut the plant back by 1/3 to 1/2 or more, down to healthy new side shoots. Add new compost and water well. 5. Fertilize producing vegetable gardens. 1. When pruning don't ever remove more than 1/4 of the total plant. 2. Don't forget to check plants often for insect damage and be sure to check the undersides of the leaves. 3. Don't prune citrus except to remove dead or damaged wood and branches obstructing pathways, views, or structures. 4. Don't use insecticides on herbs. Most bugs, including aphids, can be handled by spraying with your garden hose. If a plant become heavily infested with aphids, just get rid of it. 5. Don’t forget to keep the weeds in check. • Seeds - Beets, Snap beans, Carrots, Corn, Cucumbers, Jicama, Okra, Green Onions, Radish, Summer Squash. Remember to plant early-maturing varieties and protect your seeds from birds for best results! • Herbs: Anise, Basil, Bay, Caraway, Catnip, Chives, Epazote, French Tarragon, Lemon grass, Marjoram, Mint, Oregano, Rue, Safflower, Savory, Thyme. • Flowers: Alyssum, Begonias, Chrysanthemum, Coreopsis, Celosia, Cosmos, Gallardia, Hibiscus, Hollyhock, Marigold, Mirabilis, Petunia, Portulaca, Society Garlic, Sunflower, Vinca, Zinnia. - Mediterranean Vegetable Risotto with Brown Rice - This is one of my favorite vegetarian dishes, that is quick and easy to make. Sorry no picture for this recipe. Grow peas! These plants are some of the most productive and giving plants that you can grow easily in your garden. I planted a total of 14 snow pea plants distributed in 3 locations of my yarden last fall and over the last 4 months they have yielded 25 - 30 pounds of peas. Though they do start dying off when the weather becomes too hot, they still produce smaller yields typically through mid April. These are also great plants for the kids as they do require harvesting every other day or so and it is a bit like a treasure hunt to find the peas that need to be picked. As they are vines they do not need a lot of space as long as you have some type of trellis for them to grow up vertically. I have also grown snow peas in a large container and this works well with something for them to cling onto. Peas are great for the soil as they draw nitrogen into the soil and are often used as a cover crop to replenish the soil from heavy feeder plants. You also do not need to buy more seeds as you will get enough seeds from the previous year for the next years planting. Remember that you should soak the seeds in water overnight before planting. Peas can be planted from September through the end of February. Garden Books: Extreme Gardening by Dave Owens and Desert Gardening for Beginners by Cathy Cromell, Linda Guy and Lucy Bradley. Q: What can I use to protect my seeds from birds/critters? A: I use a combination of products. One inexpensive way is to re-use the plastic berry and cherry tomato containers that you can place over the area you have planted the seeds and secure with a garden stake. I remove the lid and use the bottom only. I cut a small hole in the bottom of the container to allow air flow. In combination I use chicken wire and 1/2" black plastic hardware cloth for vegetable borders. Both can be found at home depot. Both can be cut to size and make sure you get garden staples for securing to the ground. The chicken wire or vegetable border may not be full proof for keeping out the birds, so use this in combination with a plastic container cover for added protection.